The HiTemp140-M12 features the same rugged stainless steel body as the other HiTemp140 data loggers in the series, but offers interchangeable probe options using an M12 type connector. The M12 connectivity makes this versatile data logger compatible with the large variety of M12 RTD probes available today. The HiTemp140-M12 is capable of measuring and recording temperatures from -200 °C to +850 °C (probe dependent). 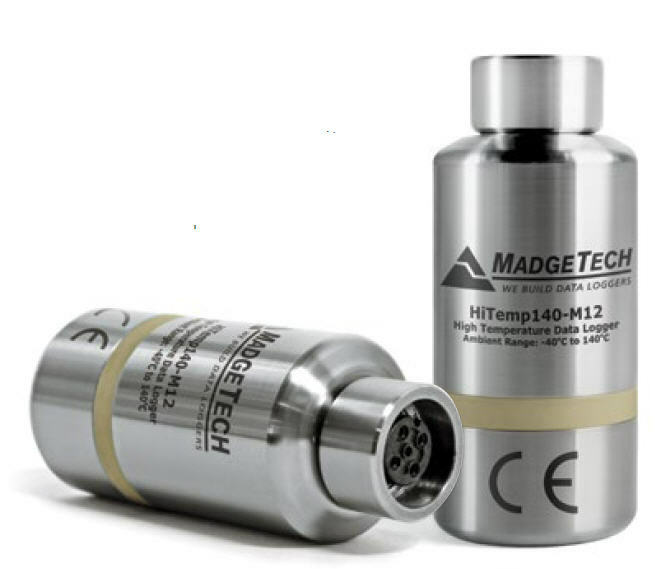 All of MadgeTech’s HiTemp140 data loggers have a water tight body enclosure made of food grade stainless steel and can be placed in environments with temperatures as high as 140 °C. The operating range of the data logger body can be extended to higher temperatures when used with MadgeTech’s thermal barrier options and suitable probe. The HiTemp140-M12 records and stores up to 43,690 time stamped readings and is equipped with non-volatile solid state memory which retains data even if the battery becomes discharged. A wide selection of compatible M12 probes are available on the market to choose from, making the HiTemp140-M12 the most dynamic data logger of its kind. With the ability to change probes as needed, this device satisfies a multitude of application needs with one powerful data logger versus the need for multiple loggers. Note: Calibration Certificate standard calibration is two points at 50 Ω and 150 Ω and is verified at 100 Ω. *Calibrated accuracies based on standard MadgeTech calibrations for 0 Ω to 200 Ω range. The logger will inherit IP rating of the attached probe (up to, and including IP68/IP69K). 100 Ω platinum RTD probe with M12 connector. 100 Ω platinum RTD probe with NPT mounting thread and M12 connector. 3-A approved 100 Ω platinum RTD probe with clean-in-place (CIP) design and M12 connector. 36 " High Temperature, Dry Heat, Flexible Probe with M12 connector. 36" High Temperature, Flexible Probe with M12 connector. One Set of Replacement O-Rings for the HiTemp140. This is an optional "Key Ring" end cap for use with the PR140, RHTemp1000 or HiTemp140 series data loggers. High Temperature, Flexible Probe with M12 connector. High Temperature, Dry Heat, Flexible Probe with M12 connector. This RTD probe is designed for clean-in-place (CIP) sanitary applications where sensor corrosion and product contamination are critical factors. 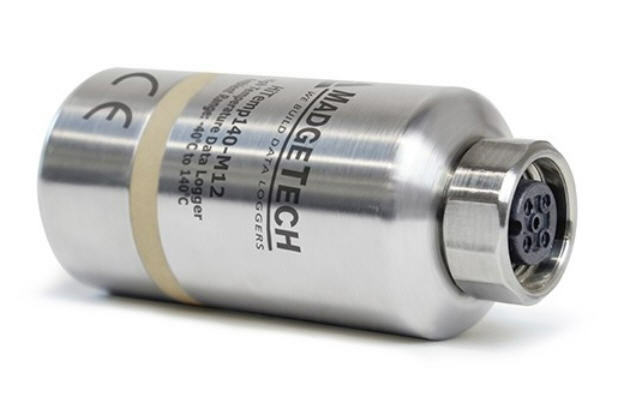 This rugged probe is spring loaded and equipped with an M12 connector, compatible with the MadgeTech HiTemp140-M12 data logger (sold separately). The 100 Ohm platinum sensor offers the fast response time needed for CIP applications. The M12 connectivity provides device flexibility and expanded application use. The M12 CIP Thermowell Probe meets the 3-A Sanitary Standard for design and fabrication. This probe is well suited for sanitary applications in food, dairy and pharmaceutical processes. For surface temperature measurement, you can use the HiTemp 140-M12 and the M12 RTD FLEXIBLE PROBE connected to the MicroDisc Surface temperature probe attachment. For applications above 140 °C, a thermal shield is available for most models of the HiTemp140 and HiTemp140-PT series data loggers. 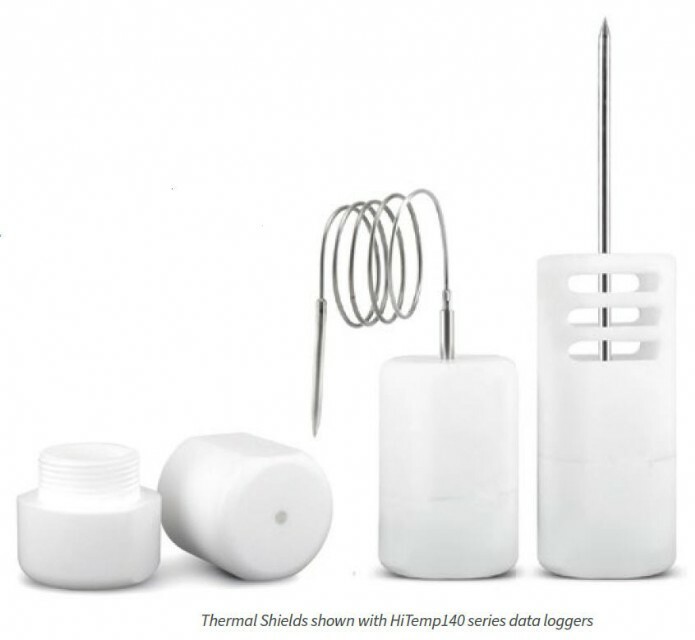 The thermal shield extends the operating temperature of the data logger, allowing it to be exposed to higher temperatures for a longer amount of time. Flush and vented models are available to help provide probe protection. Submersible, Stainless Steel, Extreme Temperature Thermal Barrier for HiTemp140 Data Loggers. The ThermoVault Max is an extreme, high temperature thermal barrier designed for use with MadgeTech’s HiTemp140-M12, HiTemp140-FP and HiTemp140-PT data logger models. This durable enclosure is made from stainless steel with PTFE insulation. The ThermoVault Max barrier can withstand temperatures up to +400 °C in dry heat applications and +250 °C for wet applications when used with the TMAX Wet Seal Kit (sold separately). With unparalleled time versus temperature performance, the ThermoVault Max provides a best-in-class solution for the harshest of applications. Designed to endure extreme temperature monitoring environments such as furnace profiling, geothermal down-hole recording, dry heat sterilization and oven data logging. MadgeTech also offers a turnkey Dry Heat Sterilization System including the ThermoVault Max barrier, HiTemp140-M12 Data Logger and M12 Depyrogenation probe. The ThermoVault Max is built for use in harsh applications that require extreme temperature monitoring, such as depyrogenation, food processing, oven monitoring, geothermal down-hole recording, and furnace profiling. IP Rating : IP68 rating may be obtained with seal kit installed from -60 ºC to 250 ºC. Rapid temperature fluctations may cause ingress. The TMAX Wet Seal Kit is used with the ThermoVault Max, extreme, high temperature thermal barrier for wet application to withstand temperatures up to 250 °C.